Updated Tuesday April 17, 2018 by Benoit Douillette. 100 new player registered with the GSLA for the first time will receive a free stick. Sticks can be picked up at our in person registrations. Our 2018 season is just around the corner. 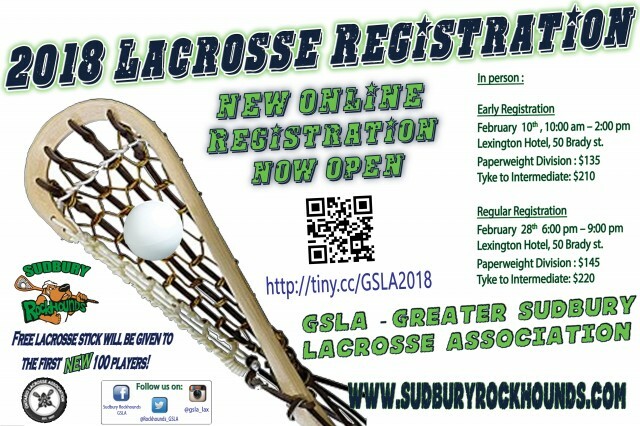 As a result of some changes and requirements at the Ontario Lacrosse Association level we will have a new online registration system for 2018. Our registration is now open. Please be sure to check back regularly for details. Registration will be available 24/7 online. Register early to avoid a $10 price increase effective Feb 12, 2018. We are looking forward to a great 2018 season. Keep your stick in your hand. NEW PLAYER FREE STICK PROGRAM: FIRST 100 NEW PLAYERS TO THE GSLA WILL RECEIVE A FREE STICK IF REGISTRERED PRIOR TO OUR CLOSING DATE. All registrations can be done on-line. ALL REGISTRATIONS requirer a copy of a birth certificate or health card must be uploaded along with the registration. You must also have a valid email address. *PLEASE NOTE: If you are planning to attend the open registration the process to register will not change. Computers and scanners will be available for you to complete your registration. Be prepared to wait as the process could take up to 15-30 min. for each registration.